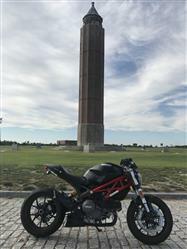 Ducati Monster 796 / 1100 QD Ex Box Exhaust System Series By Quat D.
This stunning exhaust from QD Exhausts has been designed for use with the Ducati Monster 796 / 1100, not only changing the looks and sound but also lowering the centre of gravity making for a much easier ride. Manufactured from stainless steel which has been micro-blasted, you can rest assured this exhaust is of outstanding quality and workmanship. You have to see this in person to truly appreciate the work behind this exhaust. This exhaust system is based on the principle of resonance chambers. By lowering the centre of gravity and concentrating the masses close to the ground, in an area free of movement during the change of direction are greatly increases the driving of the motorcycle. This system has a fixed non-removable Catalyst. It offers European approval by being e-marked for Road Homologation. This exhaust features removeable DB Killers.